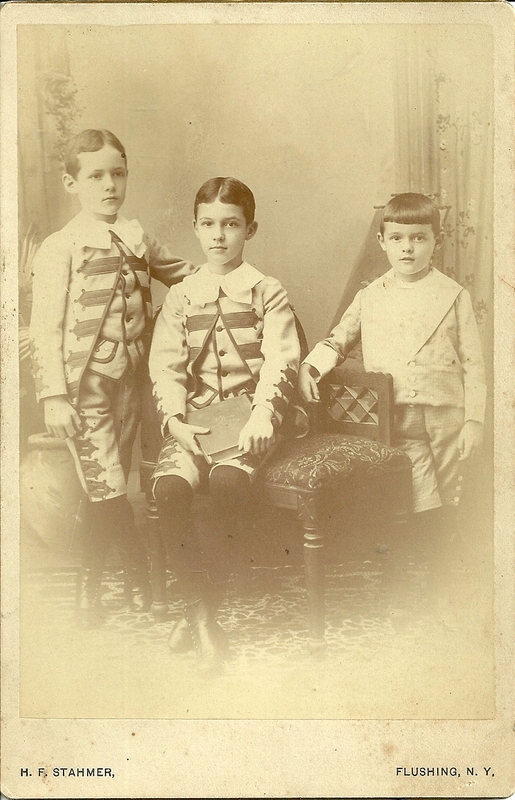 Photograph by H. F. Stahmer studio of Flushing, New York studio of three Gilman Brothers: Ned, Lawrence and Joe. 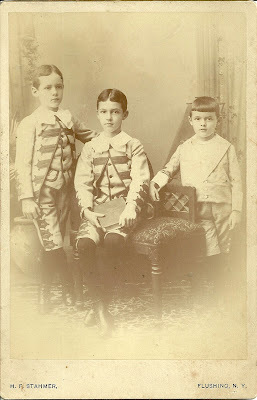 They are Edward Coit Gilman, Arthur Lawrence Gilman and Joseph Gilman. These brothers were the sons of Arthur Coit Gilman and his wife Bessie Amelia Lawrence. Their paternal grandparents were noted minister Edward Whiting Gilman, who spent time at the First Church in Bangor, Maine, now All Souls Church, and his wife Julia (Silliman) Gilman, who was the daughter of Benjamin Silliman, a professor at Yale and the first person to distill petroleum. Their maternal grandparents were Effingham Lawrence, born in New York, and his wife Jane Lucretia (Osgood) Lawrence, who was born in Louisiana. I'm not exactly sure yet which of the several Effingham Lawrences was the father of Bessie Amelia (Lawrence) Gilman. Some references have him as the Effingham born in 1817 and others as the Effingham born in 1820, who was a one-day US Senator from Louisiana. 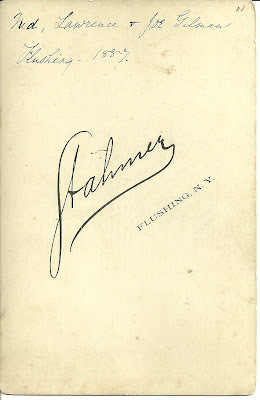 Arthur Lawrence Gilman was born 5 July 1878 in Flushing, New York. In 1904 he married Elizabeth Wright Walter. He was an author composer and music critic, working at times for the New York Herald, Harper's Weekly, Harper's Magazine, North American Review and finally, at the New York Herald Tribune. Most references have him as Lawrence Gilman, but in the 1880 Census, he was listed as Arthur L. Gilman. Edward Coit Gilman was born in November of 1879 in New York. He died fairly young, in 1909, and I don't believe he married. Joseph Gilman was born 5 May 1881 in New York. I believe he died in 1962 in Vermont. I don't know if he married. If you have any corrections, additions or insights regarding the information presented above, please leave a comment in the comments box or contact me directly.